FUNdamentals puts the FUN back in learning for all age groups ! FUNdamentals is an intensive systematic phonics learn to read program that will also improve comprehension, spelling and penmanship. It is well-suited for absolutely every age group and it is an effective remedy for any reading problem. It is FUN .. it is FAST .. it is GUARANTEED .. and it WORKS ! FUNdamentals was developed for home schooling and personal tutoring by renowned educator Jeanie Eller, M.A. It is based on the widely acclaimed classroom program called ACTION READING that first proved any normal student can learn to read in 1 school year or less. your student will be a fluent and independent reader. that enables the student to read real literature. 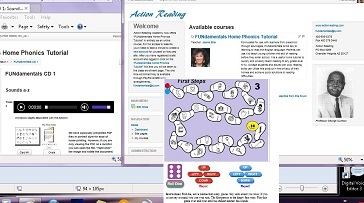 Jeanie Eller is featured on an Instructional Video that guides you through the process of learning to read. Audio lessons further guide the student through the simple, logical, step-by-step learn to read program. Students over 8 years old can use this program without any assistance. However, FUNdamentals use in a home environment helps to develop quality family relationships and we encourage continued parental participation. Older students and adults may think the first lessons seem childish. They will quickly realize the importance of starting to learn at the beginning to fill in the missing gaps in their knowledge of the skill of reading. FUNdamentals - Even more FUN with more than ONE ! This program also works great for teaching more than one student. The FUN is shared as multiple learners grow with self esteem. Students begin by learning how our alphabetic system of reading and writing was invented. They learn the sound symbol relationships of English and how these sounds are used to make words. Learn to Read while having Fun with... FUNdamentals! They progress on to sentences and finally to stories (always reading for meaning and comprehension). All learning modalities are used so that whether the students are visual learners or auditory learners they won't miss out. The student is enthusiastically encouraged to use all the senses by singing, exercising and doing other activities that reinforce the learning process. All drill practice is done with stimulating games. Remember...the more senses you use, the faster you learn! This is the only program you'll need to learn to read. Learn sounds that go together to make words. Learn symbols that we write to represent words. Learn all 70 phonograms through art, music, games, dance, whole body activities, action and competition. Used only to introduce sounds. Teaches to read for meaning from the very first word. Action Reading follows the seven steps supported by the $20 million in research from The National Institute of Child Health and Human Development.